"Weight Distributing Hitch, Equal-i-zer,receiver hitch for trailer control." 2-1/2" shank. 12" long x 6" max drop or 10" max rise. Rigid trailer attachments work with friction sway control to eliminate trailer sway. Brackets are height adjustable to control the amount of weight distribution tension on the spring arms. The spring arms serve two purposes. When raised onto the sway control brackets they transfer trailer tongue weight evenly to the tow vehicle. They also work with the friction sway control to stop trailer sway. When you spend thousands of dollars on a tow vehicle and trailer, it just makes sense to protect it. Equal-i-zer gives you the protection and peace of mind you need to enjoy a vacation. 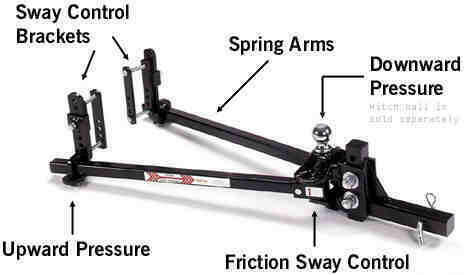 Here are a few of the many advantages to owning an Equal-i-zer -- the Original Sway Control Hitch. 1 Controls sway caused by cross winds. 2 Remains steady when large vehicles pass. 3 Maintains control on uneven roads. 4 Minimizes bounce on sectioned roads. 5 Quick hookup at any angle. 8 Compatible with electric or surge brakes. 9 Compatible with "pole tongue" or "A-frame" style trailers. 10 Dependable and proven with over 12 years on the road. 11 Distributes trailer weight to all axles. 13 Most affordable hitch in its class. 14 No "add-on" sway bars. 15 Available in three weight classifications. 16 Hassle-free turning and backing. 17 Made in the USA. Without a doubt, the biggest safety problem with towing trailers is that they can sway too easily -- leading to loss of control. 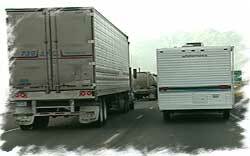 A number of factors contribute to sway, including: side winds, passing vehicles, quick lane changes, uneven roads, sudden stops, and even the trailer hitch itself. Normal hitches simply don't handle these situations well. In fact, they often enhance the problem and make driving all the more stressful. "Add-on" friction bar - added on to any chain style weight distribution hitch. While the "add-on" sway bar gives some sway dampening, drawbacks include adjustment difficulties and kinking in tight turns. Elaborate hitch system - priced between 750 and 2,400 dollars. These hitches are often complicated and difficult to use. Equal-i-zer sway control hitch - provides the most practical way to remove the risk of trailer sway. The Equal-i-zer eliminates swaying hazards by incorporating sway control brackets, built to work in tandem with the patented hitch head. This distinctive design restricts the side-to-side movement of the weight distributing arms and virtually eliminates trailer sway. The Equal-i-zer is easy to use, more effective at controlling trailer sway than two "add-on" sway bars, and has features comparable to elaborate hitch systems at a fraction of the cost. In fact, Equal-i-zer is the best value and best hitch on the market today! Another common problem encountered when towing a trailer is "highway hop," or the bouncing that often happens to trailers on uneven roadways. Uneven weight distribution is often the cause of this. With ordinary ball-type hitches, most of the trailer tongue-weight gets carried on the back axle of the tow vehicle, often this raises the front end of the vehicle. The uneven distribution makes steering control more difficult -- especially during emergency situations. Without weight distribution, the hitch sags. With Equal-i-zer, the truck and trailer are level. 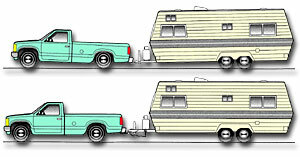 Weight distribution is needed to level a trailer and tow vehicle. Risks associated with driving a trailer without a weight distribution hitch include loss of steering control, braking difficulties, and hitch dragging. A chain style hitch - which uses chains attached to tapered spring arms. Chains are snapped onto trailer attachments distributing the weight. Equal-i-zer - replaces chains with rigid trailer attachments giving a smoother more comfortable ride. Equal-i-zer's solid, square spring arms provide you with superior weight distribution. Equal-i-zer makes towing safe and easy. When you consider all the safety benefits of the patented Equal-i-zer hitch, it would surely be worth almost any price, but it is surprisingly affordable. There are two options for attaching the Equal-i-zer to a pole tongue style trailer. #2 The best option is to use the existing brackets. (Right Picture above) Eliminate the two inside link plates. Bolt the outside link plates directly together around the pole tongue trailer. Two jam (half) nuts will be needed for the L-bracket to fit properly. We will include the jam nuts if they are ordered with the hitch. The brackets also need to be somewhere between 27” and 31” back from the center of the coupler. The arms will then ride straight back instead of spread out. There aren’t any functional or performance issues using the Equal-i-zer this way.